A group of junior high and high school students in Cambridge, Mass., are part of an experimental education program that aims to prove they’re capable of solving real-world problems early with the help of 3D printers, Arduino and group collaboration. Co-founders Saeed Arida, David Wang and Saba Ghole started NuVu Studio as a way to apply their dissertation theory, which claims that kids as young as 13 are capable of working on design and engineering projects normally reserved for those at the master’s level. By the looks of several projects involving medical devices, a game that helps you lose weight and a modular telepresence robot you can control from far away, the theory seems to be correct. The program integrates several engineering and design principles. But Arida says that when he frames it to prospective students as something of a creative-learning program instead of as an engineering or math-oriented one, everyone gets excited. “We actually don’t go into an emphasis on engineering. We just say we want to teach you the creative process and then when you are trying to create the project you need a lot of engineering,” he says. The program does more than just teach kids 3D printing, design and engineering principles, although Arida admits there’s probably not a single project that doesn’t incorporate the use of Arduino at some point. “We wanted to show people how you can create a school that is different…What the school of the future can look like,” says Arida, whose dissertation research at MIT was in creative problem solving and collaboration in K-12. NuVu students participate in the program for three to nine months at a time and collaborate in several creative projects. Some of them, like the short film that students Sam Diatzman and Christopher Smith produced on security issues after the Boston bombing, equip students with an understanding of screen writing and film production. The program started four years ago out of a local private school with just a handful of kids. It now includes a diverse group of kids from both public and private schools. There are 28 in this year’s class — 20 come from public and charter schools in the area. And though engineering tends to be male-dominated, Arida says an equal number of boys and girls attend the program. Arida and co-founders would like to change the school system so that more kids get this kind of opportunity and exposure. Arida says they also plan to expand the project nationwide, but that will take a while. 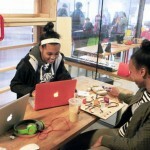 Ten other schools have adopted the NuVu Studio project so far. There are no special requirements for students interested in the program, according to Arida. They just need a willingness to learn.